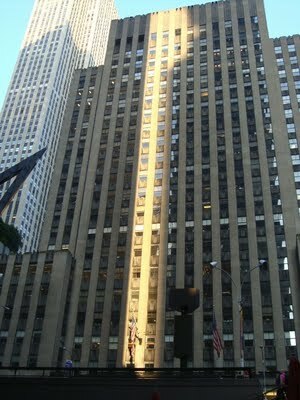 I was sitting in front of Rockefeller Center sipping a coffee and watching the big parade of humanity stroll by. 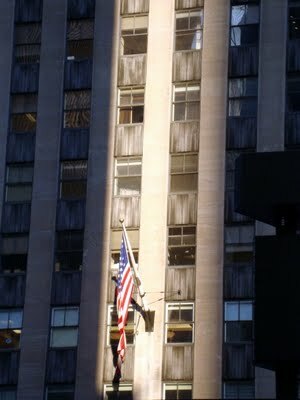 I looked up and saw this interesting juxtaposition of sunlight running up the Simon & Schuster building. The left edge of this beam runs up the building in precise alignment with the edge of the windows. It forms a perfect straight line. Upon closer examination I realized that the U.S. flag is in the middle of the beam, as if being illuminated by a stage lighting expert instead of Old Sol. It pays to occasionally look up from your laptop. I should do it more often. Fun New York Fact: The “Simon” part of the Simon & Schuster publishing empire is Richard Simon, father of singer and mope-queen Carly Simon. Carly was raised in an upper-class, wealthy New York family and spent her life doing what she loves, as opposed to having a traditional job like the rest of us. Yet, she still managed to be miserable most of the time. Way to waste it, Carly. Today I looked up as I sat next to the Monument in the city where I eat my lunch every day. Never really occured to me why it was there. But it’s rather big. Tomorrow I think I’ll read the inscription on the side of it.I’m a wealth of info really. aren’t I? i tend to look up all the time when walking down the streets of nyc. there’s amazing architecture all around you. art deco skyscrapers and gargoyles, lovely brownstones, some nice window fixtures…the view is sometimes better than looking at some of the sad sacks you see walking towards you during those rush hour times.one of my favorite buildings is this one (i think it’s corner entrance is a russian restaurant(???) in the late 50’s or low 60’s (59/60th street?) along (i believe) 6th ave. or is it b’way? i dunno. i could be totally wrong location wise as i have a terrible memory for numbers and giving directions. oddly enough, i’m never lost. at least in manhattan. b’klyn on the other hand is different story.anyways…it’s a damn beautiful building if you have any idea of what i’m rambling on about. Ellie: I give out my factoids in small morsels. I don’t want to overwhelm the internet.Jo: Open YO eyes! Please report back on the monument. Jason: Is it the Russian Tea Room next to Carnegie Hall? Or City Center with it’s beautiful tile facade? You are correct, as usual. The architecture is way more interesting than the meat sacks on the sidewalks. I knew that Carly Simon fact, yet it still doesn’t cause me to like her music. I wonder if there’s a connection there? Say what you will about Carly, but she could make music. You’re So Vain is a classic. Hmmm, I keep wondering what I would do if I wouldn’t have to work for money. Probably study photography. TE: I’m with you. She’s the Patron Saint of weepy sorority chippies. AFM: I’ll respect that song’s place in history but it will NEVER be in my iPod.Sid: If I didn’t have work for money I’d take pics, blog, help raise The Daughters, hang out in museums, smoke weed again, travel…the list is endless. None of it is a money-making activity. Great picture. I thought Carly Simon was married to Paul Simon and that was her married name. Love the photos! And I love your blog! I have been a lurker about your blog for several months now and I am hooked.My family recently spent a week in NYC and I thought about you as we walked all over Manhattan and sat with all the other tourists in Times Square. I sat there wishing I could run away from my real life and spend every day living and working in that great city. You are living the life I dream of and I love reading whatever tiny fragment you choose to share. I’m sure tourists like me must annoy New Yorkers greatly, but I didn’t meet a single angry New Yorker the whole week – everyone was remarkably tolerant.I LOVE your city, and I love your blog. Thanks! Hello, Lori and welcome out of the shadows. You are mistaken about New Yorker’s impression of tourists. We LOVE tourists. Seriously. Our city would be NOTHING without them. They give us perspective and remind us of how fortunate we are to live in Gotham City. Carly Simon – I bet she thinks that post is about her.I’ll get my coat.